Welcome to a new challenge at Fashionable Stamping Challenges. as long as it is a card…and of course uses stamps! So romance, vintage/shabby chic, femininity and softness are what came to mind for me to create. I’ve admired this style so many times and finally found the stamps to do it with. The main technique is masking with only a few embellishments. I borrowed the stamp (isn’t she beautiful), and created a one layer design. and creating some interest with the folds in her gown. on shiny cardstock. I like the soft effect of bright colours on this card. and then a little over-stamping with Watering Can Archival – added for interest. Butterfly tape was incorporated down the sides. Wow! Dot, that image is gorgeous and your water coloring and masking, so perfect! Love all the soft colors and inky layers! Love this! What an amazing stamp!!! Wonderful card altogether! You have a wonderful eye for design and detail Dot and this card shows that, it is delightful. I love the colour palette and textures to go with the beautiful images. A great job. Gorgeous creation! Thanks for sharing it with us at The Crafting Cafe! Dot I always love what you come up with, your designs are fantastic and I LOVE the colours, green with the purple is gorgeous. A beautiful card, a wonderful image and love your colouring. Thanks for sharing with us at Make It Monday this week. Gorgeous card, the details look amazing. 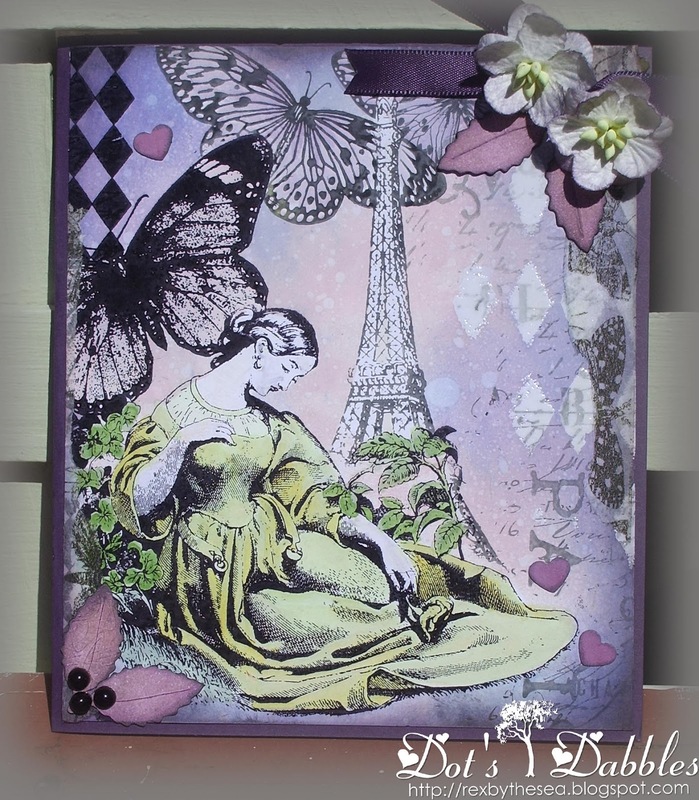 Absolutely beautiful card Dot, love the background you've created for this lovely image. What an amazingly beautiful image, and you have made it look stunning here. Love how you have built up the colour in the background and what you have ended up with! Wow… what a lovely image. The coloring on this and your embellishments are fantastic! Very pretty! Thanks so much for sharing with us at Inkspirational! This is stunning, I love this style. Gorgeous card Dot, beautiful stamping and the background colours are dreamy. Such a beautiful card, very feminine. Lovely card. Thanks for joining us at Crafty Cardmakers. An easy challenge this time, a card, you've made a beautiful one. Calling back to thank you for sharing your beautiful romantic card with us at CCM this time. Just stopping by again to let you know I featured your card as a POTW from last week's MIM entries. You can find it on my Make It Monday DT post on my blog. Gorgeous design and lovely image, really an outstanding art work. This is gorgeous. I love the colour and the whole collage you have created. Beautiful. Thanks for joining us at Inkspirational. Fabby looking card with a wonderful image. Lovely! Thanks for playing with us over at CCM this time. So romantic, and ever so slightly wistful – lovely!